The ordered lines of Jerome, Idaho (population: 10,000) start to disintegrate as you approach those parts of town that teeter on the edge of the Snake river canyon. Here the homes are "unregulated and unzoned", says photographer Michael Light, who took this shot from his own light aircraft. There seems to be a tension between the advance of civilisation and the untamed wilds. "It represents a kind of apocalyptic divine intervention upon Thomas Jefferson's vision of a pastoral, agrarian America built on the rationality of the grid," Light says, "as if the hand of God was a very displeased claw." At 1700 kilometres in length, the Snake is the longest tributary of the Columbia river to the north-west. The volcanic activity of the Yellowstone hotspot formed the Snake river basin, and for thousands of years, Native American tribes lived on its banks. Then, from the 19th century on, the landscape started changing under the influence of European settlement, creating the dichotomy so evident in Light's photograph. This is one of the images on display as part of the Positive View Foundation's exhibition Landmark: The fields of photography, at Somerset House in London from 14 March until 28 April. For more information, go to the website. 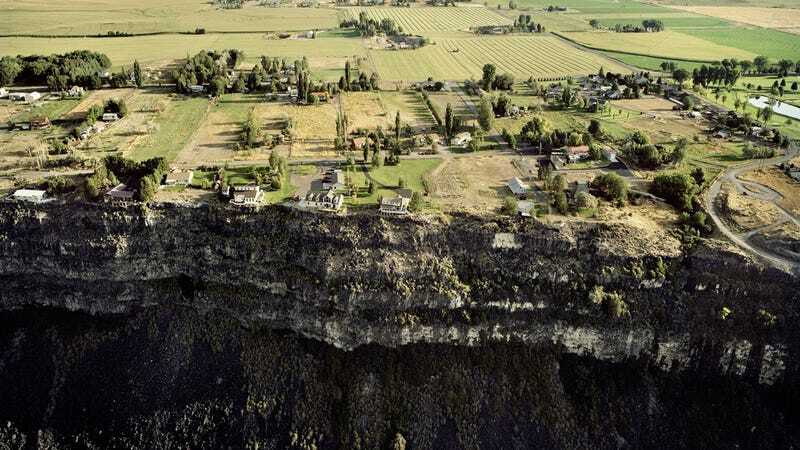 Image by Michael Light, Houses On The Edge of The Snake River Lava Plain, Looking North, Jerome, Idaho, 2009.